Courtyard by Marriott Downtown Houston is a great place to stay. It is close to the Houston Theater District, Museum District and lots of other attractions. 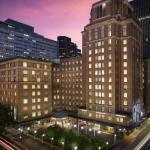 Located in downtown Houston; close to lots of attractions. Did not have pay for view TV. It was a nice hotel and the young lady that helped me Friday 2/9/07 was very helpful. Also when I checked out in the morning, the ladies were very kind. Located right downtown, easy to get to. The 185-room Courtyard by Marriott Houston Downtown is housed in the 1921 Humble Oil Building. The building has been beautifully restored from its neo-classical exterior to polished rose marble and original brass elevator doors. The nine-story, non-smoking hotel is within walking distance of the Minute Maid Park, the Convention Center and the theatre districts. The property, which is ideally suited for both the business and leisure traveler, operates a courtesy shuttle to nearby attractions including the Metro Light Rail, the Reliant Center and the museum district. The hotel has five meeting rooms for social or business events. The largest can handle up to 75 guests. All of the guest rooms, and six suites, have a large work desk with complimentary high-speed Internet access and a modern bathroom with a hairdryer and tub with spray jets. Other amenities include a wet bar, refrigerator, cable television with movie channels, and pay-per-view movies, alarm clock and coffee and tea making facilities. The hotels Humble Café is open for breakfast and dinner and there is a Starbucks on-site. Room service is available in the evenings and there is a 24-hour market providing a range of beverages, snacks and sandwiches. There are several restaurants nearby. The hotel has an outdoor swimming pool, whirlpool and fitness center. The 24-hour front desk has safe deposit boxes, a list of restaurants that will deliver and information on area events and attractions. Other facilities include a business center, on-site coin-operated laundry and an ATM. Former clients at this Marriott property say its offers good value for money compared to many of the citys full-service hotels. Major plus points were the location, friendly and efficient staff, and the complimentary shuttle to area shops and offices. Several businessmen who have stayed here said they would use the hotel on future visits to Houston and would recommend it to their colleagues and friends. Parking: Yes, there is parking. The cost is $22 per day.